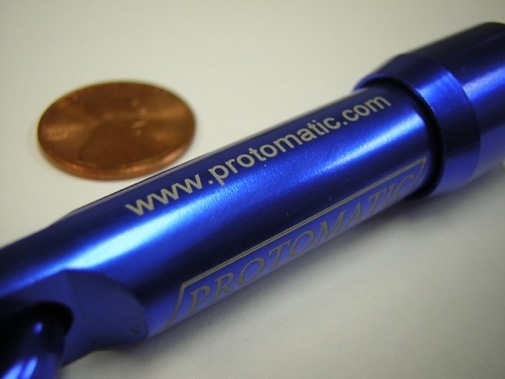 Protomatic : Protomatic shows why a CNC part isn’t done until it’s finished. Protomatic shows why a CNC part isn’t done until it’s finished. 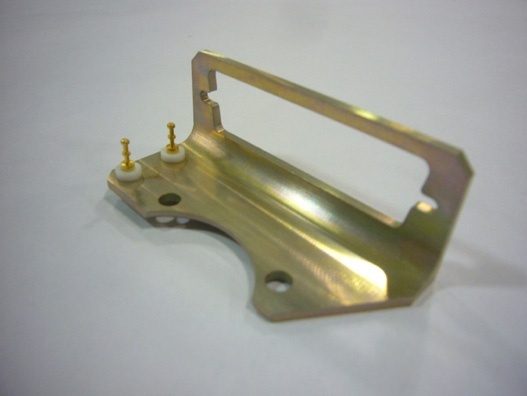 Using the proper finishing process is critical to any CNC machined part. Of course, one major benefit is the parts just look better. When parts are unfinished, the often look incomplete. The right finish conveys a perception of higher quality, which customers certainly appreciate. More importantly however, finishing allows for better observation of small flaws. 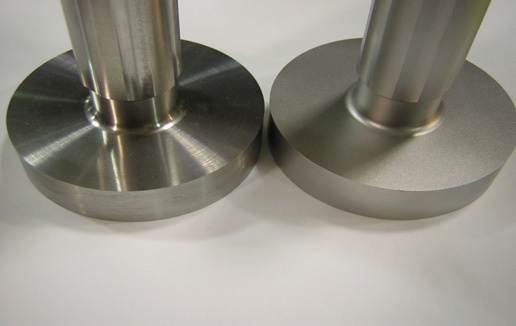 When properly finished, it is easier to see if a part has been adequately de-burred, and if small machining transitions such as tram line or cutter-to-cutter have accurately completed. 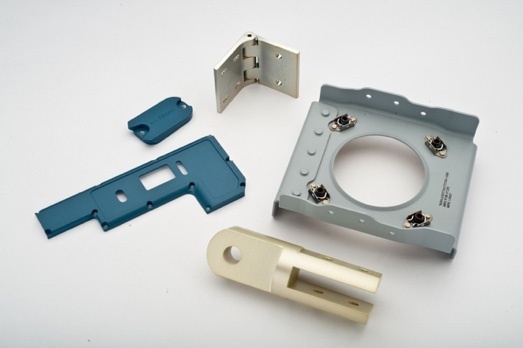 Following are some of the metal and plastic standard finishes used at Protomatic, along with end results. The most common finish is simply as-machined. It is typically specified by the Micro Finish call-out on the print. The most common is an “Ra of 63 micro inches” or less. The second most common is a fine grain finish. Left as-machined. Right, fine sand/ Scotch Brite (3M™) creates a fine grain finish. Prior to bending, a “Timesaver” sanding is commonly performed. This is a relatively coarse sand of the two flat surfaces prior to bending. Bend contact marks will be present after forming. This ECU Emulator test stand used ”Timesaver” sanding on sheet metal assy. This type of finishing is usually defined by the shape of the media used to perform the tumbling operation. Since vibratory tumbling is a gravity-based energy method, the speed is controlled by the size of the media. Heavier and larger media is faster, but size and shape control the level of detail when deburring inside corners. These parts are individually tumbled to prevent part to part nicks. This peristaltic pump hose clamp assembly used tetrahedron-shaped media, with Anodize Clear Type II. Available is magnetic media tumbling for small delicate parts, creating near polished (not shown). Another common finish is a uniform matte finish, created with a spherical glass bead. This is typically specified by the size of the media and the pressure of the air blasting nozzle. Size of bead can be found seen in mil spec. MIL-PRF-9954. Other media such as silicon carbide or aluminum oxide are not spherical. When those media are used, they create a uniform finish. But since the media is cubic, not spherical, the indents are cubic shape. This cubic shape creates micro flats, and when rotating a part, it will glisten occasionally when the reflection angle is just right. Micro blasting is available for intricate small parts. This pencil sized blaster uses media similar to a fine “baking soda”. For castings, shot peen stress relieves surface tension creating a more stable part after machining. Additionally, shot peening will make the part look more uniform and will remove some casting flash or blend minor casting mold mismatch seams. This is a cleaning, corrosion and static-electricity-based coating protection that is only used on aluminum parts. It is ideal prior to molding, adhesive or paint primer applications. If someone says “anodize,” they mean ASTM-A-8625 Type II. Although this standard has three different types, Type II is the most common. Various colors available from clear (natural), to reds, greens, and blues. The most common anodize color is black. 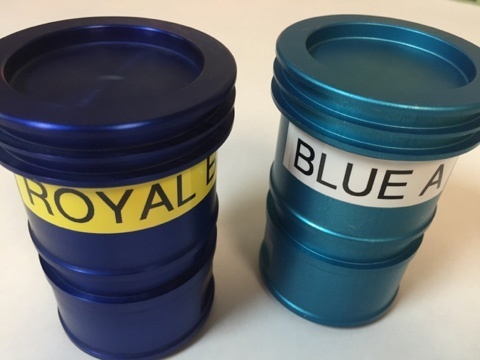 Anodize ASTM-A-8625 Type II, royal blue and blue A. 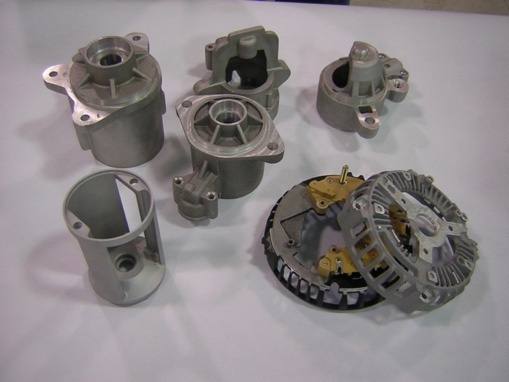 A series of processes are typically used for painted parts. Common processes are typically an initial chemical film Mil-DTL-5541; then CARC primer, and finally a CARC paint. Example parts from chemical film Mil-DTL-5541; primer gray; and blue CARC. 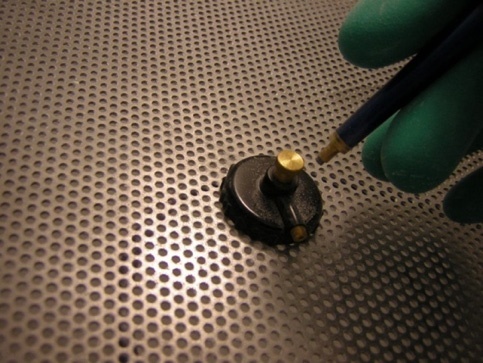 Polishing operations are best performed on hard materials. 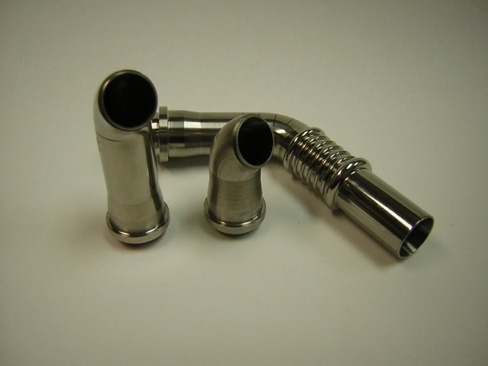 These parts are polished through a sequence of progressively finer sand paper and polishing compounds. Medical-grade polishing requires compounds that do not use animal lard-based rouge polishing sticks to minimize possible biocompatibility cross contamination. Post-polishing typically requires a cleaning operation such as Passivation ASTM-A-967 or ASTM-F86 for removal of micro-fine iron. Titanium 6AL4V Gr 23, (ELI), tubes ID and OD polished to Ra 2-4 Micro Inch of roughness, then laser marked and passivated. Finishing touches make the difference. 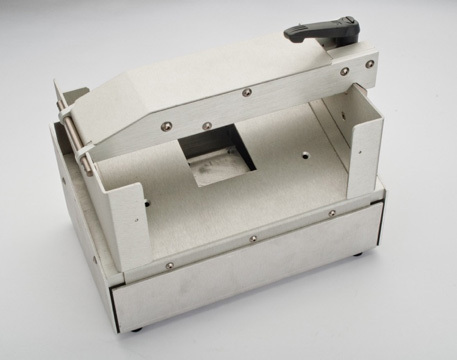 Laser marking is available with a 4-axis fiber laser marker. This example of a blue anodized aluminum part was laser marked to remove the anodize, and created a white/natural color for the logo and font. Font can be marked down to 0.010’’ high. Bar codes and thousands of images are available. These are just some (many others not included) of the various finishing processes that are available to engineers. I hope they give you more insight in the purpose of these specialized finishing operations and why they are performed. 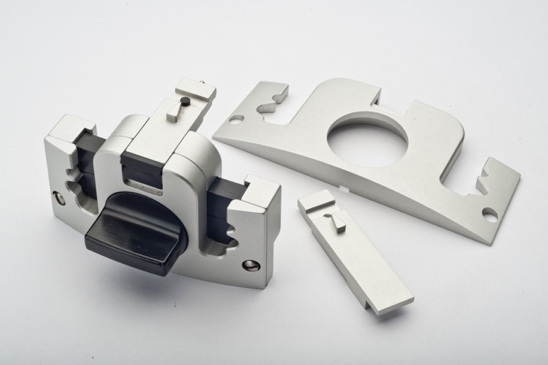 Finishing is just one of the many considerations when choosing a CNC machine shop. For a complete list of things to look for, please download the free guide, Tips for Choosing a Prototyping Machine Shop. If you have any questions please contact Doug Wetzel.